New York Gov. Andrew Cuomo declared a state of emergency as a big winter storm hits the region. But, that doesn't seem to faze most businesses in Manhattan. Calls to many locations of Duane Reade and Fairway Market reveal it's business as usual. Stores that are open 24-hours plan to stay that way even as the brunt of the storm hits later tonight. 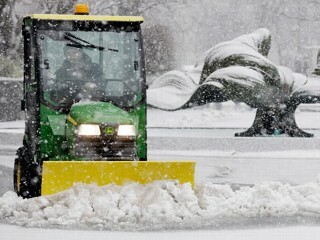 New York City could see a foot of snow and up to two feet in other parts of the state. Gov. Cuomo says 2,300 flights have been cancelled and many of the regional airports will close early. If you have a store location affected by the storm, please leave a comment at the bottom of this page.